Jeremy Corbyn is the twice-elected leader of the Labour Party, and Prime Minister in-waiting after securing the biggest increase in the Labour vote since 1945. This return to genuine democratic socialism within the Labour Party would have seemed like an impossible fantasy just a few years ago when they were completely dominated by the right-wing element of the party and the neoliberal 'party within a party' Progress faction. Labour's transformation back into a centre-left party has been one of the extraordinary political developments of the early 21st Century, and it's no surprise at all that this transformation has attracted hundreds of thousands of new members, and millions of new voters. Obviously members of the centre-right neoliberal faction are absolutely incandescent with rage as the vice-like grip on the party that they maintained for well over two decades has been broken, and now they've realised that they've lost control, they're regularly going completely berserk in order to do as much internal wrecking as the can before they leave the Labour Party. One of the most high profile of these destructive Berserkers was the MP for Middlesbrough South and East Cleveland, Tom Blenkinsop. Blenkinsop bitterly opposed Jeremy Corbyn and sent streams of Twitter abuse at anyone who opposed his deliberate wrecking tactics. He quit as an MP at the 2017 General Election, but he'd already done so much damage in his constituency that his successor couldn't hold the seat, meaning a Tory win in a seat that Labour had held since it's establishment in 1997. Blenkinsop didn't just take his ball home because he was losing at football, he stabbed the ball (that wasn't even his) and then spread shards of broken glass all over the pitch to make sure nobody else could play. Another notable Berserker was the major Labour Party donor Michael Foster who decided to launch an extraordinary cry-bully rant in the fanatically right-wing Daily Mail propaganda rag in which he bullied and abused Jeremy Corbyn supporters as "Nazi stormtroopers" before crying that he's the victim of abuse! Foster was eventually thrown out of the Labour Party for this abusive rant, but his Berserking didn't stop there, he actually decided to stand against Jeremy Corbyn in the 2017 General Election but his attempt to damage the Labour Party resulted in a huge humiliation as Corbyn romped to victory in Islington North with over 40,000 votes to Foster's 208. A new Berserker attack is going on in the London Borough of Haringey, where the Labour right still held control of the council. The Labour Council leaders there were so right-wing that they devised an enormous and highly controversial £2 billion privatisation plan called the Haringey Development Vehicle (HDV). The HDV privatisation plan is vehemently opposed by both Labour MPs in the area, a significant swathe of the local population, and numerous Labour councillors on either side of the Corbyn divide, who consider it a monstrous concoction of corporate profiteering, autocratic rule, and social cleansing. After a string of setbacks over the HDV the Labour Council leader Claire Kober realised the game is up and her vast privatisation scam is going to be binned, so she decided to announce her resignation in the most damaging manner possible for the Labour Party, smearing the widespread public resistance to the HDV as some kind of sinister and sexist Corbynite plot against her personally. These allegations were like manna from heaven to the mainstream media and the BBC Politics team, who have presented numerous extraordinarily one-sided accounts of the chaos in Haringey, often completely failing to mention the massive HDV privatisation plot in their haste to attack Momentum and the Labour left. 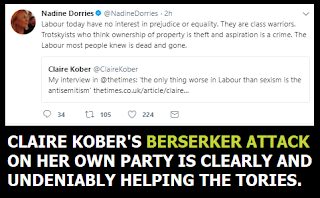 Kober's Berserker attack also been a massive gift to the Tory party, with Tory MPs gleefully retweeting her attacks on the Labour Party in order to score as many political points as possible for themselves. Very few mainstream media accounts bothered to give the other side of the story, that Kober's downfall was the result of massive local opposition to the HDV, and the fact that over two dozen women signed a letter saying that "vocal opposition to an unpopular policy which is being implemented in a paternalistic way without proper consultation is not bullying or sexism, it is democracy" has not been mentioned at all. 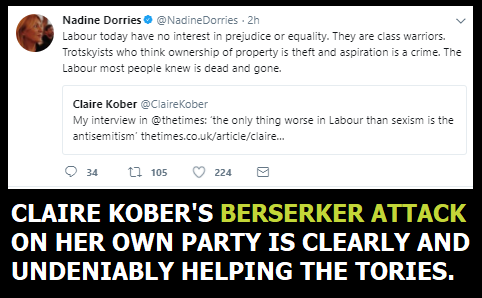 Kober is so furious that she's not going to get her own way on the controversial HDV privatisation that she's intent on doing as much wrecking as possible. If she can't rule over Haringey like an unaccountable tyrant then she's going to damage the Labour Party as much as she possibly can in revenge. Nora Mulready is another pro-HDV right-winger to quit the party with as much noise as possible, even writing a prolonged anti-Labour diatribe in the hard-right Daily Mail propaganda rag in an effort to inflict as much damage as she possibly can. What Mulready "forgot" to mention in her furious Daily Mail article is that on the day after she resigned and went berserk she was due to face a disciplinary panel over complaints made about her behaviour back in the summer of 2016 (such a coincidence eh?). Would someone who is as innocent as Mulready claims to be really decide to resign one day before their disciplinary hearing so that it doesn't go ahead, or would they stay and fight to clear their name? Imagine being such a misleading person that you'd write a massive screed for the Daily Mail crying about the supposedly abusive behaviour of your rivals, without even mentioning that you're quitting one day before you face a disciplinary procedure of your own! 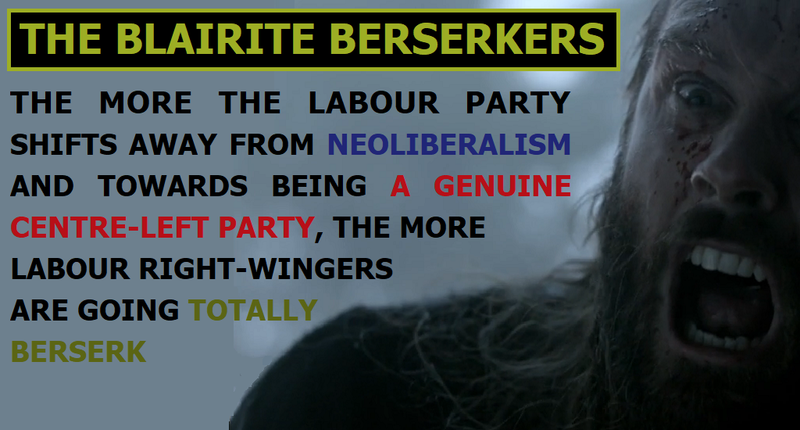 Just as the ancient Norse Berserker warriors were devoted to the bear cult, these modern day Labour Party Berserkers are devoted to the Blair cult. From the spectacularly failed Anyone But Corbyn coup plot, through the torrents of abuse lobbed around by cry-bully Blairite Berserkers like Tom Blenkinsop and Michael Foster, to the damaging antics of the Haringey wreckers, these Blair cultists are clearly very much more wedded to their right-wing ideologies than they are to the Labour movement. 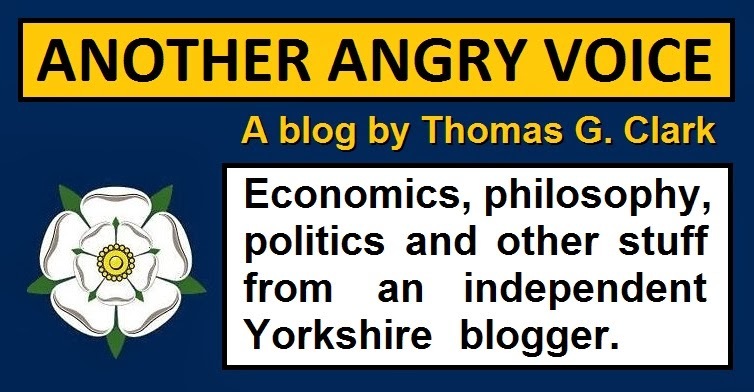 Sadly it's beyond doubt that ever more Labour right-wingers are going to go Berserk and deliberately inflict as much damage as the can on the the Labour Party and the labour movement because they can't have everything their own way any more. The Blairite Berserkers behave in this extraordinary manner because they'd clearly rather have the Tories running the country than a Labour Party that is being run on genuine democratic socialist principles. 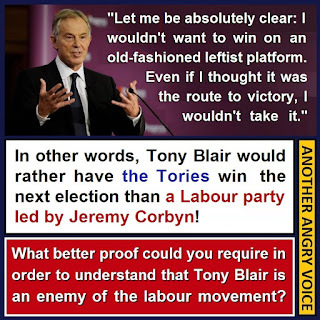 Don't just take my word for it that they feel this way, take their idol Tony Blair at his own word (see picture). Many on the right of the Labour Party will stay and try to work constructively to promote their own view of the direction the Labour Party should take, and they have every right to of course, because the Labour Party has always been a broad church. 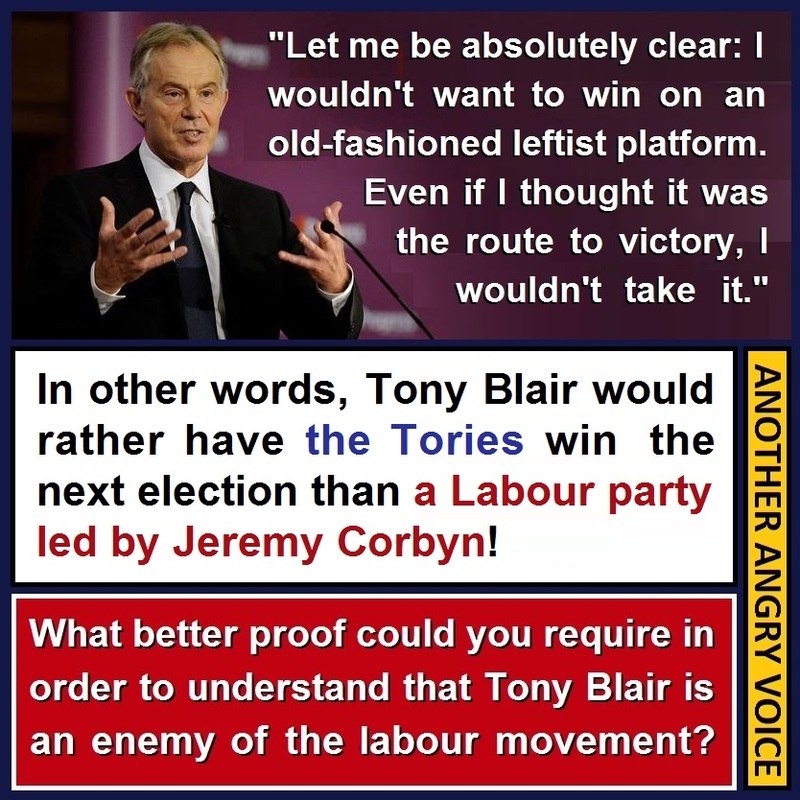 Just as left-wingers like Corbyn, Skinner, McDonnell and Abbott stayed within the party when it was under the complete control of Blair and the right-wing Progress faction, right-wingers can stay now that they find themselves as the fringe element as the party is led genuine democratic socialists. But there's a huge difference between staying and trying to constructively promote your own view of the direction Labour Party should take, and actively supporting these highly destructive Berserker attacks. Not only are these Berserker attacks damaging the Labour Party and materially assisting the Tories, they're also tarnishing the already battered reputation of the Labour right by association. If Labour right-wingers ever want to be taken seriously again, they need to sort their acts out sharpish and actively disassociate themselves from the appalling antics of these Berserkers, rather than siding with them and actually retweeting their outrageously misleading Daily Mail hatchet jobs. The more the right-wing of the party actually associate themselves with these Berserker attacks, the more they create the impression that they too actually hate the Labour movement, and only ever joined the Labour Party because they considered it a convenient vehicle for their right-wing political agendas.